Sometimes called a minibike, a pocket bike or a scooter, a mini motorcycle is a small version of a full-sized bike. These bikes are usually approximately 2 feet high and weigh about 40 pounds (Source). These mini motorbikes can be electric powered or gas powered. Because these bikes can be either battery powered or gas powered, you’ll need to decide where you’re going to be riding it the most. If you’re going to be out in the country, most experts recommend having a gas engine since refueling only takes a minute or two if you run out. However, if you’re going to be rolling around your neighborhood, the neighbors will appreciate the quiet operation of an electric bike over gas (Source). Here, we take a look at five mini bikes to give you a better idea of what to buy. The Razor MX350 is a mini dirt bike that’s electric powered. The single-engine is super quiet, which makes it ideal for riding where peace and quiet are valued. The large, knobby tires proved great traction off-road, and the battery is rated to give you about a half hour of riding time. The Coleman Powersports 196CC is a gas-powered trail bike with an engine that puts out 5HP. It features an easy pull start, and thick tires for a smooth, comfortable ride. Chances are if you had a minibike as a kid, it was something like this, and your kids are sure to have just as much fun with it as you did. Next is the Xtremepower 40CC 4-stork gas cycle. This bike features sleek styling that resembles the “crotch rockets” you see on the roads. The engine puts out enough power to get this up to 18mph. Lastly, the pneumatic street tires make for a smooth ride and deliver plenty of grip. It’s a hot looking bike that’s a lot of fun to ride. The Monster Moto is an electric bike that has the same styling as those old-time mini bikes we all rode as kids. The battery charges in about 5 hours and an indicator on the handlebars that shows you how much charge you have left. This bike features a sleek powder coated tubular frame that’s designed to last. Riders said the bike is super sturdy and has plenty of torque for an electric motor. Last up is the Razor Pocket Mod that’s fashioned after a vintage euro scooter rather than a traditional motorcycle or dirt bike. This, too, is electric powered and designed for a more leisurely ride than the previous bikes. The variable speed engine puts out enough power to get this up to 15 mph, and the suspension system ensures a smooth, bump-free ride. The seat flips up to reveal a convenient compartment, which makes it ideal for kids who want to carry along a snack when riding (Source). This electric motocross bike offered by Razor is well-made, safe, and an excellent choice as a gift for children. Users love the design and the price, but some do note that it has only one speed, which is disappointing. The Razor mini motorcycle features a quiet, chain-driven motor with throttle control, large knobby tires, a hand-operated rear brake, and a battery life up to 30 minutes. Another great thing about this product is that it can go as fast as 14 miles per hour without pedaling, and it’s suitable for off-road riding. The maximum weight is 140 pounds, and it’s designed for children age 13 and up. As a whole, buyers have a favorable opinion of Razo scaled down bikes, and they highly recommend them as one of the best mini motorcycles available. A reviewer shares that set up is easy and that his 7-year old son loves to ride it. He adds that it’s not very fast so that he doesn’t have to worry about accidents. Another user observes that the battery last longer than he expected and that his son has been riding it for months with no issues. A buyer also mentions that it’s smaller than he expected, but a 5-year old fits perfectly. However, some customers have complained that the motorcycle is not as well-made as they expected and that it doesn’t work well. Some also point out that the battery is short-lived. 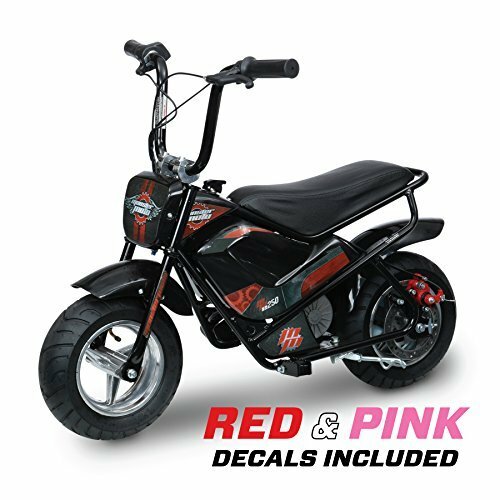 If your child likes motorcycles and wants to ride one, you can take a look at this gas powered mini bike offered by Powersports. Users love that the product is easy to assemble, but some do note that they had issues with the shipping. The Coleman scale-downed trail bike features a 4-stroke OHV cylinder, a 6.5 HP engine, a sturdy metal frame, a load capacity of 200 pounds, and a handle operated braking system. Another great thing about this product is that it has low-pressure tires to ensure a soft ride in addition to the easy-pull start operation. However, it doesn’t include racks. A reviewer observes that the Coleman bike is tremendous fun and that it’s suitable for rough terrains. He adds that he is going to buy another one the moment his current one breaks down. 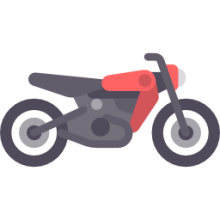 Another user shares that you can’t beat the quality of this mini motorcycle and that the engine is powerful and works smoothly. A buyer also states that he was worried about the weight capacity, but it turned out that a person well over 200 lbs can ride it with no issues. However, a couple of customers have complained that the package arrived without the necessary hardware and that the boxes were poorly packed. Some also point out that the bikes are not very durable. This pocket gas power motorcycle offered by XtremepowerUS is stylish, well-made, and available in five colors. Users love the price and the design, but some do note that it’s smaller than they anticipated. 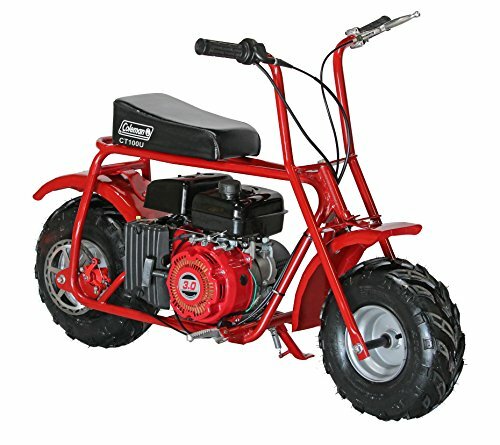 The XtremepowerUS mini bike features large 11-inch pneumatic street tires, front & rear brakes, a maximum speed of 18 mph, a chain drive, and a four-stroke EPA approved motor. Another great thing about this product is that it has a cruising range of 42 km per tank (the gas tank is 1.2 l). The maximum rider weight is 165 lbs., which make is perfect for children. However, keep in mind that the recommended age is 12. 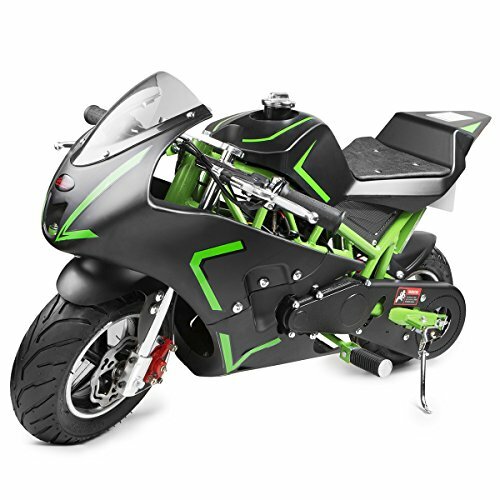 A buyer shares that the XtremepowerUS mini bikes come almost fully assembled and that the initial setup takes no more than 10 minutes. He adds that his 5-year old fits perfectly on it, but warns that the bike goes fast so that you have to be careful. Another user observes that it looks just like the real thing and that customer service is helpful if you run into a problem. A purchaser also states that the product looks sturdy and that his kids have a great time riding it. However, a couple of customers note that they had problems with the bike from the start and that it’s not as well-made as they expected. If you want to surprise your kid for his birthday, you can take a look at this electric mini motorbike offered by Monster Moto. Users love the stylish design and the price, but some do note that they have issues with the charger. The Monster Moto bikes feature a powder-coated steel frame, no-dent, polypropylene fenders, a 250-watt motor and a charger, which connects directly to the bike and will charge the battery in five hours. Another excellent thing about this product is the speed limiter switch (7-11 mph) so that you don’t have to worry about your child’s safety. The package also includes a toolkit and a manual. The electric motorbike is available in four colors and a 1000-watt model. As a whole, buyers have a positive opinion of Monster Moto mini motorcycles, and they highly recommend them. A reviewer comments that his 5-year old son loves the miniature scooter and that it fits him perfectly. He suggests that you purchase a set of training wheels. Another user observes that the Monster Mono product feels sturdy and safe and that the quality is far superior that he expected. A buyer also remarks that it’s easy to change speeds and that the battery last for hours. However, a couple of customers have complained that the item arrived damaged and that it didn’t work smoothly from the start. Some also point out that it’s cheaply made and it’s not going to last. This miniature electric scooter offered by Razor is stylish, well-made, affordable, and available in six cute colors. Users love the storage compartment under the seat, but some do note that the plastic is easy to scratch and damage. The razor mini electric bike features a chain-drive electric motor, a steel frame, 12-inch pneumatic tires, a rear suspension system, a twist-grip acceleration control, and a maximum weight capacity of 170 pounds. Another excellent thing about this item is that it has variable speed so that it can reach up to 15 mph. What’s more, the built-in battery can last up to 10 miles on a single charge. It’s suitable for children over 12, and it has a 90-day warranty. 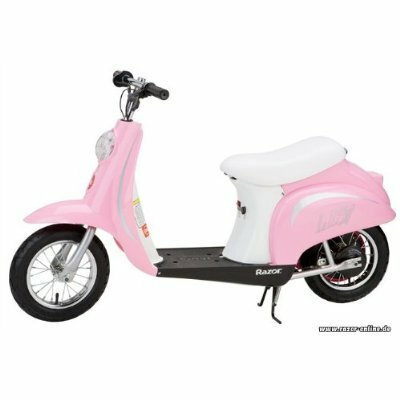 In general, purchasers have a high opinion of the Razor motorcycle, and they highly recommend it as one of the best mini motorcycles for girls. A reviewer comments that he was surprised by how much the battery lasts and that his little girl has been riding the scooter for the last few months with no issues. Another buyer states that the motorbike goes fast and that it has a great braking system. He adds that his 10-year daughter loves it and rides it every day with no problems. However, some customers have complained that the miniature bike doesn’t work well from the start and that it loses power. Some also note that they had issues with the tires. Over on Reddit, one user posted some pictures of his 75 German Dax. This black and silver micro motorcycle almost resembles a Harley Davidson model crossed with a moped. Over in the motorcycles subreddit, one user solicited the community about their thoughts regarding kids riding pocket bikes. He says that he has a 10-year-old neighbor who just received a gas powered pocket bike and he’s been riding it throughout the neighborhood and even to his school. Surprisingly, he says, the kid isn’t wearing safety gear. And what’s even more alarming is that at the low end it’s going 20 miles per hour and at the high end it gets up to 50 miles per hour. Now his own children want to get in on the fun and they are asking for him to buy one of them- he cautions them to make sure to wear a helmet before riding! His own child has an electric stand-up Razor scooter which he says can reach about 15 miles per hour, but these micro powered pocket rocket bikes are a whole other matter. Other posters empathize with the predicament by saying that these pocket bikes are not street legal. As well, other people say that because they ride them on the roads they are seriously at risk of getting hit by cars that have trouble seeing them as they drive. One user suggested coordinating an excursion to a local dirt trail or open field where the kids can get some experience riding in an enclosed area. Another motorcycles subreddit reader posted a video entitled “The Hayabusa Of Mini Bikes”. One person responded, saying that over a decade ago they had got really invested in the pit bike crossover craze. He says that he had a Honda CRF50 that had aluminum frames on a 150 cc motor. In a nutshell, the bike itself costs over $1,000 and he had modified it with over $6,000 in parts- on the downside, going that fast on a small bike is incredibly dangerous and he ended up wrecking it. Another poster explained that tricking one of these dirt mini bikes out to reach top speeds will cost thousands of dollars in aftermarket parts, particularly the carburetor and motor. Cheaper parts can be purchased as aftermarket modifications from an auction site like eBay where you can find a kick-start lever, an oil cooler and turn signal modifications. The MiniPocketRockets website provides a detailed overview of the different crossover styles for adults as well as some historical perspective. They say that these racing vehicles feel like full-size motorcycles but they are less expensive, lighter weight and smaller size than their full-size counterparts. They caution, however, that these are not toys- they are incredibly efficient instruments that employ gas and oil engines that can go over 47 miles per hour. They have a variety of names including super pocket rockets, miniature choppers, but they say they’re technically they are a combination of Yamaha Racing bikes and Chopper-style motorcycles. One of their most popular sellers is the Predator mini chopper. This is a chrome encased option that is incredibly flashy but it’s bolstered with leatherette seating. It’s even configured with a high degree of customizability- featuring an adjustable handlebar, tire pressure, throttle, and brake sensitivity. This means that you can customize the ride experience for the terrain you’re eating up on one of these super fast two-wheel vehicles.